US toy-makers Mattel and Hasbro posted disappointing third-quarter results on Monday, with shares in the former hitting a five-year low. Mattel's stock fell heavily after it said US sales of its key Barbie doll crashed by 30%, and world sales by 18%. California-based Mattel is seeing girls being lured away to competing Bratz dolls, made by MGA Entertainment. Mattel saw profits fall 12%. Hasbro's rose just 4%, but said sales of its key Star Wars toys were strong. Toy-makers are being hit by rising energy prices and are in the middle of an extremely competitive pricing market. 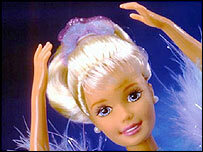 "The staggering number (for Mattel) was that US Barbie dipped 30%," said analyst Margaret Whitfield at Ryan Beck. Mattel reported third-quarter earnings of $225.3m, down from $255.8m a year earlier. Hasbro reported third-quarter earnings of $92.1m, up from $88.7m a year earlier. As well as strong sales of its Star Wars products, Hasbro said there had been growth in its games division, which includes the Monopoly board game and is not as vulnerable to increased plastic costs. Meanwhile, specialist media group Entertainment Rights said it had reached agreement with Mattel for the home entertainment and television distribution rights to the next three animated Barbie feature length movies. The titles will be released in the UK on DVD and video throughout 2006. Is Barbie past her shelflife?